Last weekend, Darlene Chevalier tweeted about SciStarter's new partnership with Philadelphia Media Network. Each week, a Philadelphia-based citizen science project will be showcased on PMN's media outlets. Since I am living in Arlington, VA, the news inspired me to present projects based in the DC Metro Area. 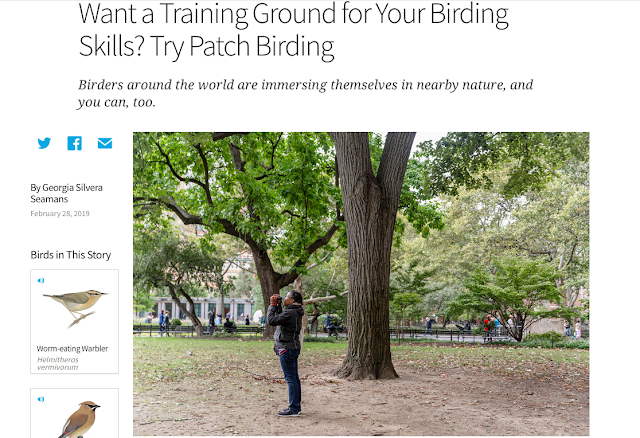 If you recall, I did something similar for New York citizen science projects last year. I conducted a simple search using keywords "Washington, DC," "Maryland," and "Virginia" in the SciStarter Project Finder. You don't have to have a SciStarter account to participate in the research projects but please note that some projects may have expired. For example, the Cricket Crawl DC/Baltimore event was held in August 2015. Smithsonian's Neighborhood Nestwatch: Volunteers for the Smithsonian Institution's Neighborhood Nestwatch in the Washington, DC, area team with scientists to find and monitor bird nests and to record and report their observations. Casey Trees: Casey Trees is a Washington DC-based organization that enlists volunteers to help restore, enhance, and protect the tree canopy of our Nation’s Capital. BUGSS: BUGSS stands for Baltimore UnderGround Science Space. We are a community lab for amateur, professional, and citizen scientists and a place to be curious about biotechnology and have fun responsibly. Blue Catfish Watch: Show us your blue catfish catch! Collaborate with scientists at the Smithsonian Environmental Research Center to help us track the expanding range of the non-native blue catfish into the upper Chesapeake Bay and into Delaware Bay and the Delaware River. Be A Smithsonian Archaeology Volunteer: Join the Smithsonian Environmental Research Center (SERC) Archaeology Lab as we excavate two sites on SERC property this summer! Work with scientists and students to excavate sites, preserve artifacts, and collect environmental data to understand the ways that people change the land has changed (or not) over the past 200 years. BiodiversiTREE: BiodiversiTREE is an experimental forest on the campus of the Smithsonian Environmental Research Center in Edgewater, MD. In fall of 2013, staff and volunteers planted more than 20,000 trees in 75 plots. Some of the plots have one species, some have 4 species, and others have 12 species. Over the next 100 years, professional and citizen scientists will collect data to better understand the impacts of forest biodiversity on environmental factors such as tree growth, insect diversity, and soil quality. Communicating Climate Change: Maryland Science Center: Maryland Science Center's Communicating Climate Change project needs volunteers to take temperature measurements across the urban-rural gradient. The study will look at Urban Heat Islands, which provide a glimpse of what the world will look like with warmer temperatures. Jug Bay Macroinvertebrate Sampling: Maryland's Jug Bay Wetlands Sanctuary needs volunteers to collect, count, and identify macroinvertebrates (small animals without backbones) in its streams. The sanctuary is in southern Anne Arundel County, 20 miles east Washington, D.C., and 18 miles south of Annapolis, Maryland. Cricket Crawl DC/Baltimore: Discover Life is calling all citizen scientists in the DC/Baltimore area to help them map out the distribution of crickets and katydids through the city and suburbs of Baltimore, Maryland and Washington, DC. Participants can track the sounds of these insects during the annual Cricket Crawl event held on the evening of Friday, August 21st 2015. West Virginia Breeding Bird Atlas II: The West Virginia Breeding Bird Atlas Project needs volunteer surveyors to document the breeding status of bird species. Surveyors register for atlas blocks and agree to provide adequate survey coverage either in the form of hours spent atlasing or number of species encountered – or both. Surveying a block involves documenting all bird species encountered. Their breeding status is recorded based on a series of codes which categorizes them as possible, probable or confirmed. Loudoun County has five projects listed on SciStarter. They are administered by Loudon Wildlife Conservancy. The projects shown above are fairly diverse so I hope residents of the DMV can find something to suit their interests. And no matter where you live, don't forget that National Citizen Science Day is celebrated April 16 to May 21. You can find events here. P.S. The DC Cherrypicker is not a citizen science project and it's utility has passed for this year - cherry tree blossoms are past peak -- but it is a cool app nevertheless. Bookmark it for 2017.